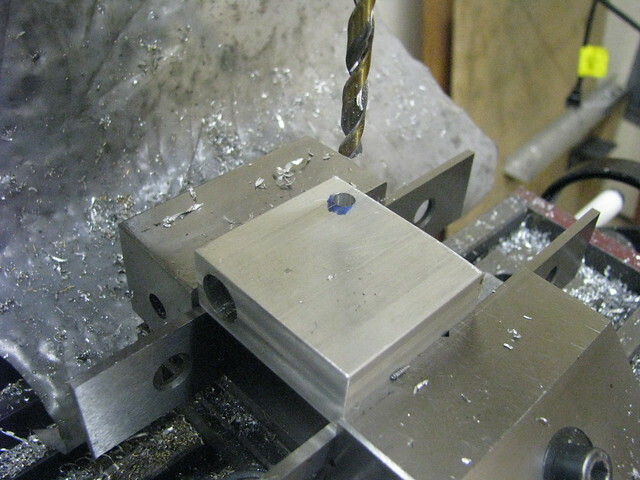 The cylinder is .5" drilled 1.375" deep. 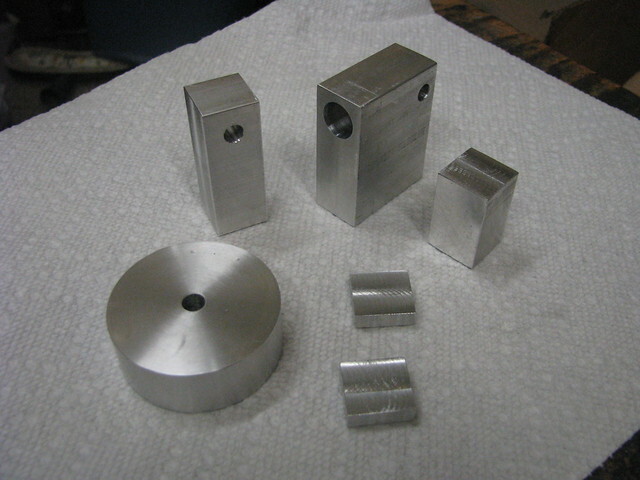 Piston is .5" long and stroke will be .75". 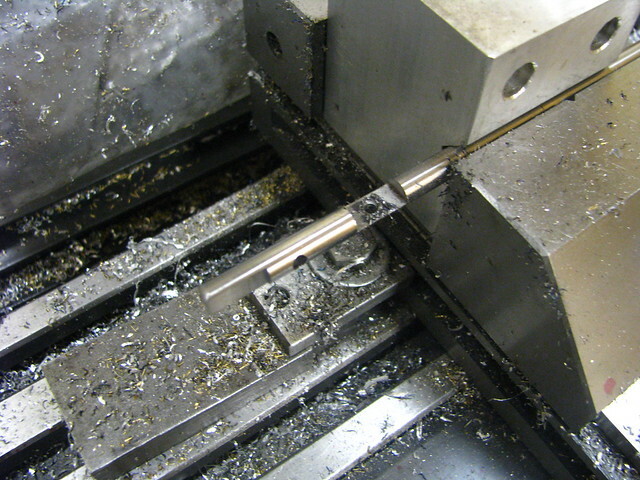 Behind the cylinder is a .25" hole cross drilled. This will house the valve. From the rear of the cylinder a .125" hole is drilled all the way through to the cylinder. The air supply will connect here. The valve is the main change I made to the original runner design. The original had a piston valve that had to push against the air pressure to work. Instead I brought the air supply in the rear and used a hole in the valve to control the air inlet. I made a flat on the end of the valve that is .5" long and .050" deep. This is the exhaust port. On the other end of the valve is a flat that is rotated 90 degrees for the linkage and tapped for a screw to attach the link arm. I took a little different approach to the link for the bell crank. This link has the ends 90 degrees apart and it has to move in two different planes. In the past I have used a .25" round rod and just drill it with the ends rotated 90 degrees. I have seen a flat piece used and twisted in the middle to get the holes aligned. In this case I decided to use some linkage from an RC helicopter rotor. These ball links are threaded and can pivot over a wide range. Plus the threaded rod that connects them makes it very easy to adjust the length. 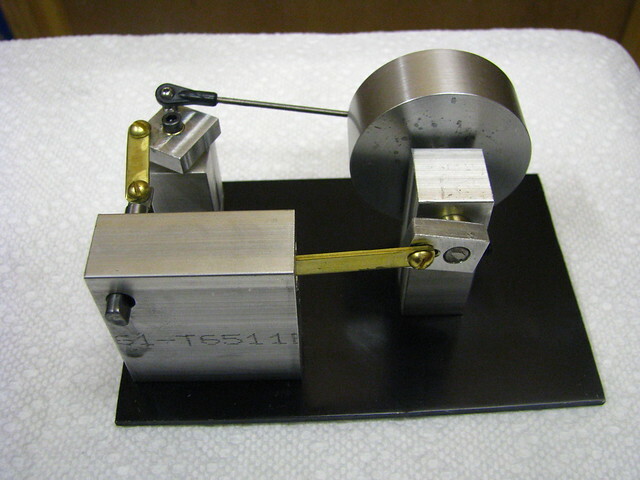 Here is the bell crank. I made a brass pivot for it to ride on. 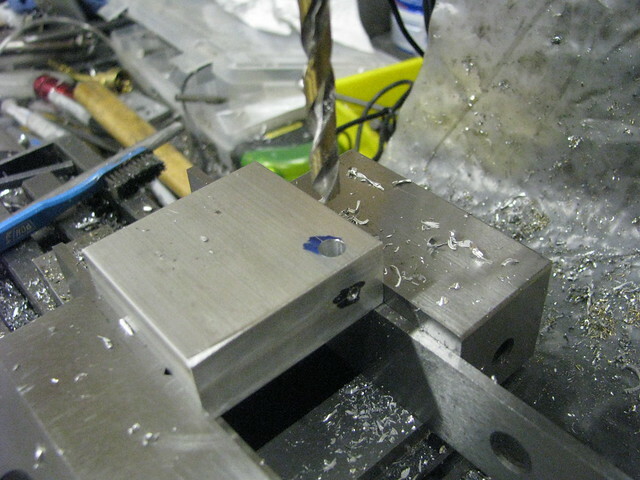 Then drilled / tapped holes at two corners. Flywheel and Piston are the same as the last engine so no need to show them. There you have it. I have some drawings in process and will get something posted. Also thinking about moving my original EZ Engine over to this same material / format. I like that! It looks as though it's madly shaking hands with itself. I like the changes you've made, it looks a more convincing engine than I recall the original plans showed. Nicely done Rick. That should inspire some newbies wanting to make their own engines. Very nice Rick!! I agree with Zee, would make a very nice first engine. 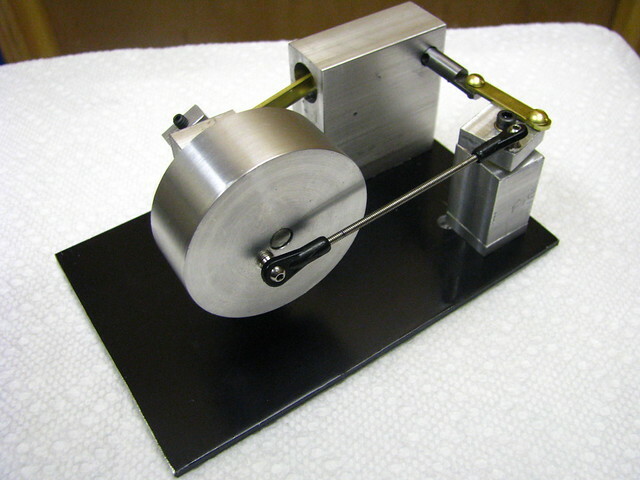 That's what I call simplified, very nice Rick and a great first engine project. 1. Does anyone know the name for this type of valve? I have used it a couple of times and don't know what to call it. If I get my third engine done there will be 3 engines that are very similar in construction but use 3 very different valve / timing methods. 2. These are just prototypes at this point. If you have a comment, idea or suggestion to make them even more beginner friendly post your thoughts. When I am comfortable with each I will do more of a step by step build instructions. Here are the basic dimensions for this engine. 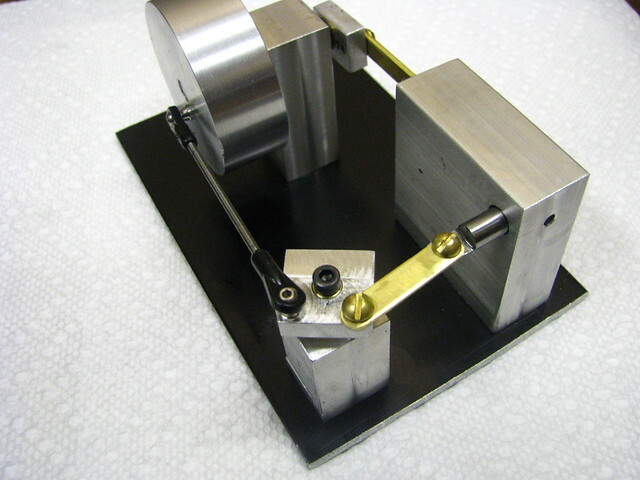 Pretty simple as is my first one I used a piece of brass as a valve machined it bet it and stuck it in the valve plate. and made a valve rode from a piece of coat hanger. primitive but effective. I used a piece of square aluminum tube with hat bushings for the main bearing and a sqare piece of aluminum held with super glue to hold it to the base the bottom plate is drilled and tapped for a thread. my second one is clear and see through. I used a e clip and groove to hold the valve plate down on bothe versions the second one uses a piece of bycicle spoke for the valve rod.